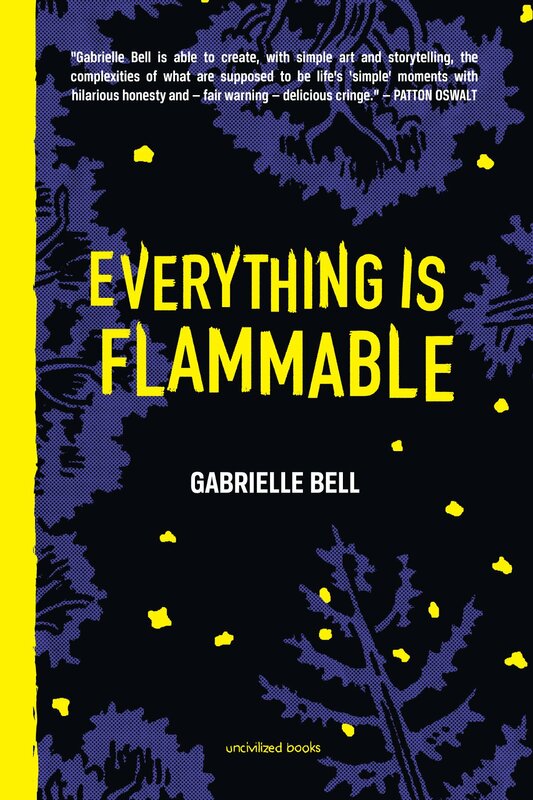 Gabrielle Bell’s comics are works of nervous intimacy. Her scratchy pen hews rough scenes of life’s daily slog, like her boring city commute from upstate New York, doing chores, and the occasional late-night panic attack in bed. She gardens, her friends visit, she goes to therapy. She overshares often but there’s comfort in her TMI: her readers are immediately enlisted as confidants, pulled into a life that’s at once universally relatable and internally, uniquely complicated. A distant disaster pulls Bell out of her city routine. Her mother needs her: she lives in a rural trailer park in upstate California and her house just burned down. Bell flies out west to help her mom translation into a pre-fabricated home and documents the entire visit with sketchbook in tow. In California, these scenes indirectly haunt her stories with her mother — she and her mom are left to use a pay shower, eat homegrown food, and work together with locals to find some kind of hospitable lifestyle after the fire. 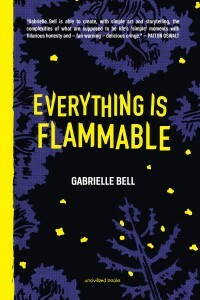 There is a thin layer of detachment and culture-clashing exploitation on the surface of Everything Is Flammable, but it’s something that Bell openly discusses throughout the book. She talks about posting her observations on Twitter and YouTube for hits, and how she initially wanted to go out West to help her mom but also to get some great stories. This may sound off-putting but it’s ultimately endearing to watch as Bell subtly pulls away that scrim of mild selfishness. While in New York, she writes about her book deals, her fans and online followers, and consistent the guest appearances by all her city friends are difficult to keep straight. Out west, in a sleeping bag, she and her mom drift into shared memories, away from all the clutter. She tries to play it indifferent, coolly distant, but she loves her mom and wants to make sure she’s situated with good people and in the best way possible. With no city quirks to zero in on, she writes about herself: chapters about her abusive stepdad and their old family pets emerge from Bell’s isolation, unearthed and unedited. In a remarkable stretch of scenes, Bell captures her nervous aversion to mother-daughter intimacy, the subsequent acceptance of their relationship, and a quiet but weighty amount of emotional growth. “I come from a line of nervous women,” she writes with a definitive sort of acceptance, but Everything Is Flammable shows how much wider that history is. Bell also comes from a loving, resilient mother and is loving and resilient in return. And she shows us that we, broadly, come from a line of neighbors, of outreach and kindness, connected lives that influence our psychology and capacity to emotionally grow.